Theresa May is still in Argentina engaging in "productive" talks with her fellow G-20 leaders, but back at home, some interesting developments in the interminable odyssey that is the Brexit talks have taken shape. Yesterday, we reported that a handful of May's most senior cabinet ministers had nearly completed a 'secret' "Plan B" Brexit deal that is said to closely resemble the "Super Norway" framework that many Brexiteers have said they would prefer. This "alliance", which has reportedly been meeting in secret for about a month now, is reportedly working with sympathetic EU ministers to try and build a consensus for selling the deal during the chaos that would likely follow a Parliamentary defeat of May's draft plan. Meanwhile, May herself has reportedly backed away (at least, to a degree) from her insistence that her deal is the only and best possible deal. To wit, she is said to be considering holding a "meaningful vote", which would allow MPs to propose amendments that could eventually be brought to a vote - in essence allowing Parliamentary to forge a more palatable deal by consensus. 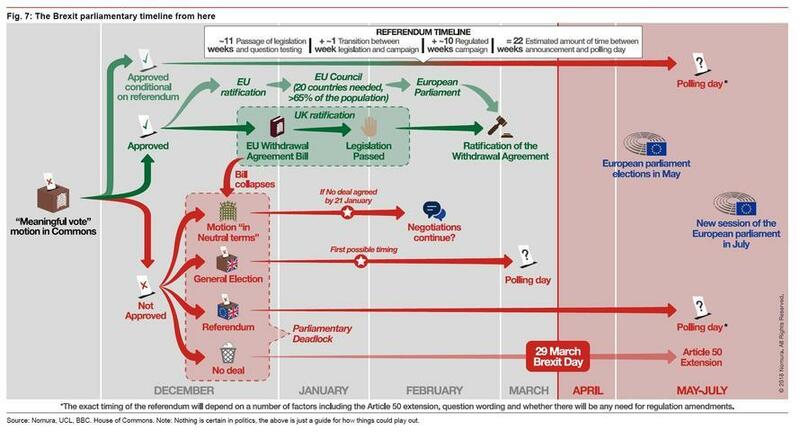 Of course, both of these alternatives are still in the trial balloon stage, and May's official line hasn't changed since EU members voted to finalize the draft plan an its attendant (nonbinding) political 'statement' last week. At least 100 Tory MPs have said publicly that they would oppose May's deal. And while May narrowly escaped a leadership challenge from within the Conservative Party last month, it appears her opponents across the floor are preparing to capitalize on this broad-based discontent (not just within the conservative party, but crucially, within the DUP and SNP, two regional parties that have helped prop up May's government) by preparing to call for a vote of no confidence in the government should May's deal fail, according to Bloomberg. Labour’s Brexit spokesman Keir Starmer said Sunday during an interview with Sky News that, if the deal vote fails, it would be "inevitable" that Labour would call for a vote of confidence in her government. Conservatives have every reason to take these threats seriously. In fact, in what looks like a dry run for a no-confidence vote, Labour has joined with the DUP to demand that May's government release Attorney General George Cox's legal advice in full - not just the detailed summary that May committed to releasing following a vote last month that requires her government to be 'transparent' about the attorney general's findings, according to the Guardian. This could be hugely problematic for May because Cox has reportedly warned that the EU could be tied to the UK 'indefinitely' through the backstop. And if Cox's official legal advice substantiates this view, the odds of winning over even some of the rebellious Brexiteers in the European Research Group faction would plummet to near-zero. But amid the chaos, the glimmer of a second chance has emerged for May's doom Brexit deal. 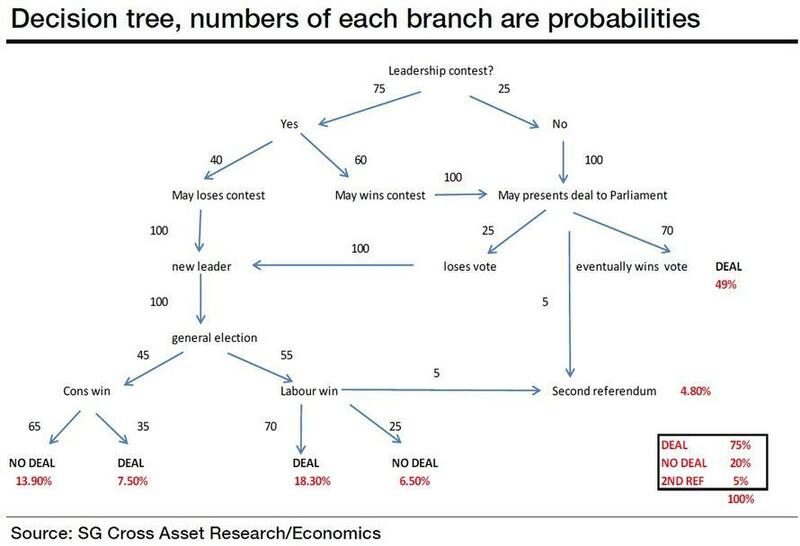 As conservative leaders grow increasingly anxious about the possibility that Labour leader Jeremy Corbyn could force a general election - presumably, he would do this by successfully winning a no confidence vote following the defeat of May's Brexit plan as UK financial markets exhibit a TARP-like reaction (see our handy Brexit guide for more) - potentially resulting in Labour winning a majority, some senior ministers who had previously opposed May's deal have apparently decided that there really is no palatable alternative. During a Sunday appearance on Andy Marr, Environment Minister Michael Gove (who just weeks ago reportedly turned down the Brexit Secretary post) has, in a remarkable reversal, thrown his support behind the deal, saying that backing the "imperfect" deal is "the right thing to do". Perhaps Gove has finally realized that the Conservatives have so thoroughly damaged their relationship with the DUP and SNP - both of whom feel betrayed by the deal - that anything short of passage would risk a defeat of the conservative majority, or at least a "People's Vote" on the deal that could function like a second Brexit referendum. Wall Street has attached high odds to either outcome. Or maybe Gove has simply recognized that time is running out.